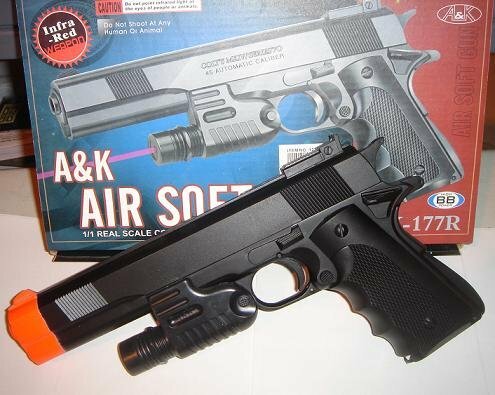 These 10" airsoft hand guns have a built in laser pointer with an on and off switch on the side. Laser is non removable. Uses 6mm plastic BB's (included) and 6mm Paintballs (not included). Great for target practice, with the same look and feel of a real pistol. Complete with 12 round magazine and starter pack of BB's. Shoots approximately 180 feet per second. Takes (3) AG13 batteries (included). Gift boxed. Pistol has an orange tip that complies with Federal Laws. Any quantities are available. Email me if the quantity you want is not listed or you would like a larger order.